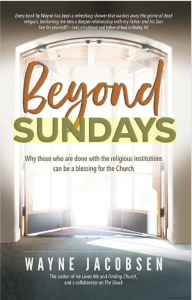 Wayne Jacobsen’s great new book, Beyond Sundays (176 pages published by Trailview Media) is essential reading for those seeking to better understand and engage with the reality that tens of millions of Jesus-followers are leaving the typical church structures they’ve always known while they continue to intentionally pursue their relationship with Christ, His people, and His mission. If you are one of these people, or you know someone on this journey and you’re trying to understand what’s happening to them, this should be the next book you read. Wayne has been a personal encouragement to me since 2001 when we planted a new church in Central California (just a few miles from the one he had planted several years before). In the early days of our newly-launched congregation, Wayne came on several occasions to speak to our group and to exhort us about what it really means to live in the Father’s love. As I look back, Wayne tried during our one-on-one conversations to express many of the things to me that he shares here in Beyond Sundays, and I simply could not listen to them. I was too set on starting another Church, and nothing was going to stop me. Interestingly, Wayne was also one of the first people to call me just two weeks after I made the calculated decision to leave my twenty-year journey of career-track pastoring in 2013. He was driving by our town and called me to see how I was doing. I responded, “How interesting that you called when you did. There’s a lot to talk about!” In our conversation over lunch that day, we re-visited many of the things he had tried to tell me years before. Many of those insights of fatherly and sage wisdom are here in Wayne’s new book. What follows are some of the big take-aways that I had as I read it. Don’t be overwhelmed by the fact that there are 24 chapters here. The book is only 176 pages, and it will take you just a few hours to read. Those who also abandoned their faith along with their connection to a church. Those who abandoned their connection to an institution but who have remained strongly committed to Jesus, his people, and his mission in the world. Chapters 6-9 are an encouragement to people on the brink of leaving the structures and institutions they have always conflated with or understood to be church. Jacobsen calls into question the conventional wisdom about the necessity of church attendance, the typical Bible texts used to coerce people into thinking that being part of an institution and attending meetings is what the Bible means by calling us together, and the whole notion that a Christian needs a pastor’s (or a church’s) “covering” in order to be under the protection of Jesus. Chapter 9, “Seven Markers to Help You When You’re Done” is an absolutely essential summary of what Wayne calls “A ‘Thrival’ Guide for Those Who Find Themselves Outside of Conventional Congregations.” Anyone who has been on this journey is going to resonate with every word. Anyone who is getting ready to leave an institution but keep following Jesus, loving His people, and engaging in His mission, should read this chapter first. The Dones is the most recent label attached to them. They have been called revolutionaries, outside the box, free-range Christians, or the de-churched. Such labels serve the media’s need to talk about trends among specific groups and for others to market products inside those trends, but they really aren’t helpful to the work Jesus is doing in the world. (Kindle Locations 883-885). Chapters 13-23 could really be conceptualized as a crash-course for those outside the Institutions who still want to live intentionally for Jesus and his mission in authentic community with others. My own family has been on this journey for four years (the past two years with a growing community group that has truly become our church family, though it has never become an institutional church). So much of this section resonated with me. The reader will find helpful ways of thinking about community, gathering, the role of sermons (as compared with other — and more effective — ways of learning), relationships as the primary forum for discipleship, sharing the gospel as a gift, and truly living as a full-time missionary in the world. Chapter 24 is Wayne’s epistle to The Saints Scattered — a truly brotherly (and fatherly) final word of encouragement to Jesus people who find themselves outside of what has always been familiar. No matter where you are on your own journey to follow Jesus Beyond Sundays (whether it is a new reality, or something you’ve been doing for years), this letter from Wayne will speak right to your heart and help you stay on track. If you’re like me, and you have a growing library of books for people who are learning to be church outside of institutional structures, this one deserves a space on the shelf (but don’t shelve it before you read it). May we all be encouraged to be Jesus’ people together, under His Lordship, in community with His family, and on mission with Him.